This post is sponsored by Mirum and all opinions are my own. Today most definitely feels like a Monday. Lots of work to catch up on after a four day weekend with Justin and Heidi. Lots of downtime shopping sales, tv binging and skipping my workout (sigh). So it's back to it today and I'm happy to say I don't have the Tuesday blues. I actually love getting reorganized and preparing for the days and weeks ahead. It's so hard to believe June is almost here and before you know it, summer sales, fall debuts, and then even holiday prep. Phew! 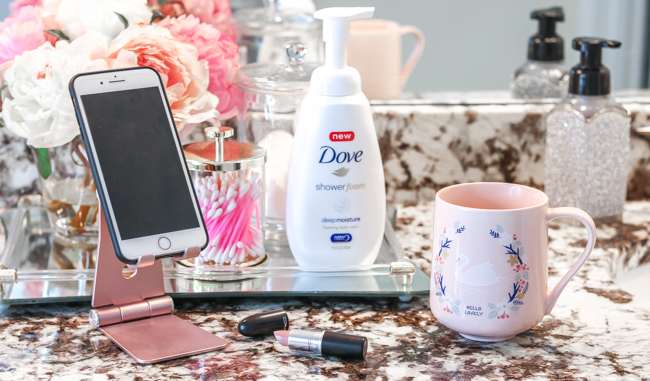 For today's post, I'm sharing a NEW product from Dove at CVS. 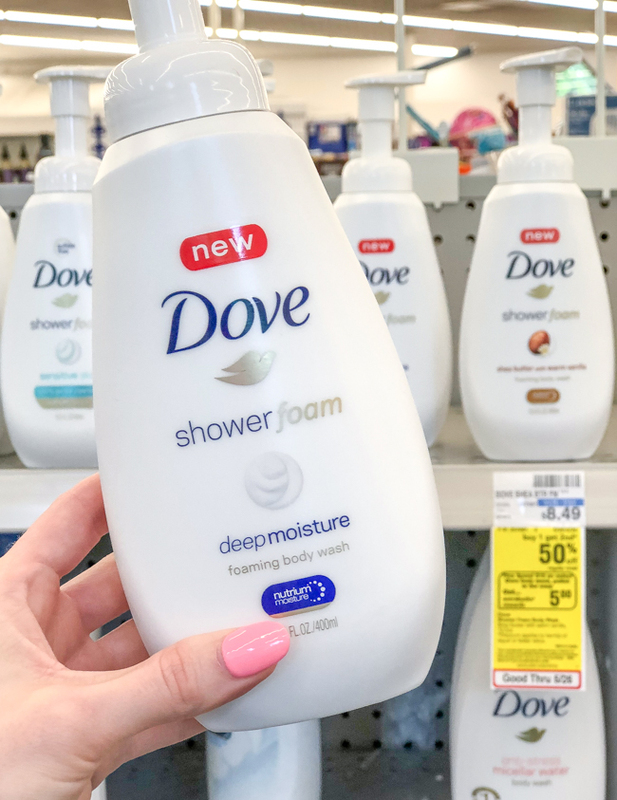 It may seem simple and silly but I've been on the hunt for a favorite body wash for some time now and just haven't been able to find one I love. I have my tried and true shower oil, razor, shampoos, and conditioners, but I always go back and forth on my an all over cleansing body product. 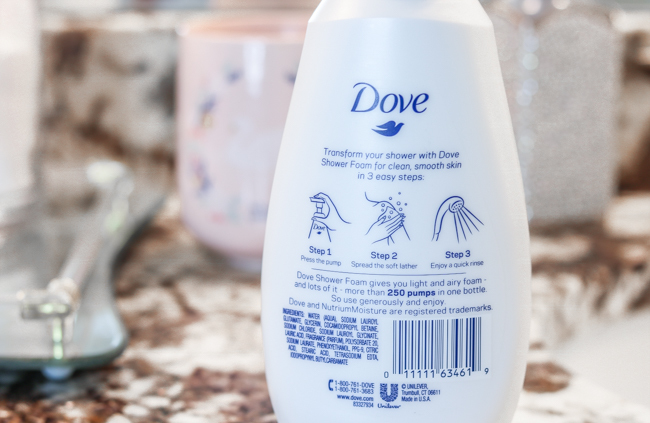 Dove's Shower Foam caught my eye originally because of the beautiful, sleek look... such a sucker for clean, well-designed packaging! I'm not a morning person (oh, how I wish I was), but I do love my morning routine, especially on the weekend. I usually take a leisurely shower, spend more time to do my makeup & hair with music and a hot cup of coffee. And since my phone is always by my side, I like to catch up on direct messages and share products on IG. 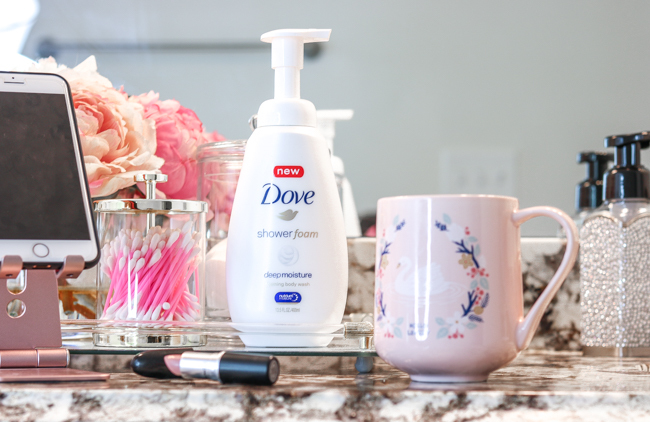 I like to keep new things on the counter beside me so I don't forget, and this weekend it just happened to be Dove's NEW Shower Foam Deep Moisture Body Wash.
What I love most about this product is that it comes with a pump! Doesn't that make everything better?! SO much easier, especially when your hands are wet and soapy in the shower. AND there's no loofa needed... I don't know why I have an aversion, but every time I've had one I never use it. And thankfully now I don't need one. It's designed to have an instant lightweight, airy texture and it smells delicious! 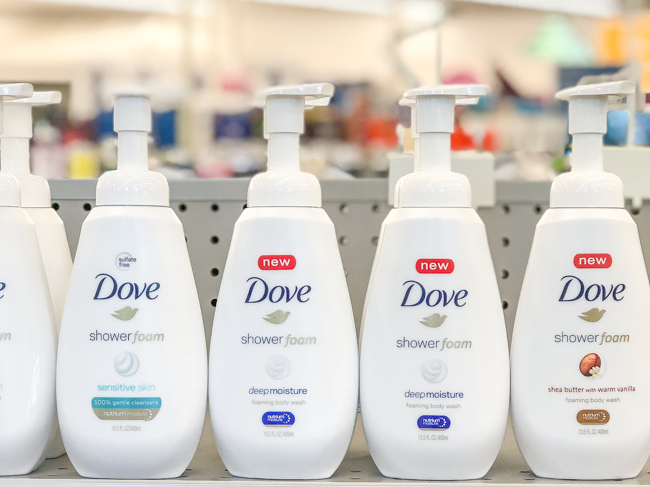 Funny to say, but I actually look forward to using it so much more than I have any other body wash... probably because it's just so easy to use and it has a luxurious texture. The minute it comes out of the pump it's incredibly soft and smooth, and it's a really interesting feel because it's automatically lathered. Again, it sounds silly, but it's SO much quicker and comes off with water easily leaving your skin feeling like silk. I also love using this foaming body wash when I'm self-tanning because it leaves my skin nice and moisturized (and smooth) but without any kind of residue that makes tanning difficult. I find that some body washes leave a slick film that interferes with how well my self-tanner goes on. But the foam does not and luckily leaves my skin less dry since every habitual self-tanner knows, you can't put on moisturizer before tanning... except on your elbows and knees, of course. I've been on the hunt for a while now trying different products from CVS and so far this is definitely my favorite! It also has 250 pumps per bottle so it'll last quite a while between Justin and me since we share body wash with a neutral scent. OR if you're not up to sharing lol, they created a version for men too! 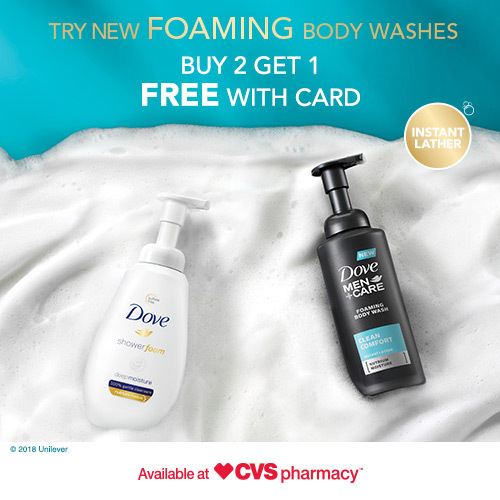 If you're interested in snagging Dove Shower Foam for yourself, you can buy two, get one free with your CVS card! Have an amazing Monday, I mean Tuesday hehe!